For many, the Christmas giving is just winding up. Here at Save vs. Dragon, it's just winding down. Over the last couple of weeks, I've given away 24 items for the 12 Days of OSR Christmas hosted at Tenkar's Tavern. Here's a quick recap of who received what, and from whom I still need to hear. BTW, those names below marked with an asterisk have not sent me appropriate info. For print, send mailing info; for PDF send OBS email address. For those who have already sent me OBS address but have not gotten their PDF code from OBS, please email me again and I'll try to take care of it. in the "drawing" for this item. In a nutshell, I'm making 2 posts each day for commenters... 1 for the Creature Compendium and 1 for the Basic Psionics Handbook. Each will be open for 24 hours, offset by 12 hours from the other giveaway. 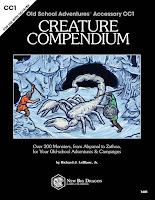 Creature Compendium comments on a post are open from 6am EST (when the post goes up) to 6am EST the next day (when comments for that post close, and the next post goes up for comments). 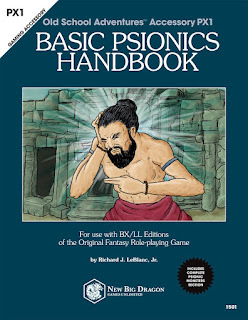 and Basic Psionics Handbook comments 6pm EST (when the post goes up) to 6pm EST the next day (when comments for that post close, and the next post goes up for comments). All winning print items will be shipped at the conclusion of this contest. All winning PDF items will be sent (through OBS) within 48 hours of the selection of the winner for that day. UPDATE: This copy goes to Tony! Congrats! international copies have already been awarded; see below). Comment on this post to be included in the "drawing" for this item. Comments close at 6am EST tomorrow (December 21, 2015). 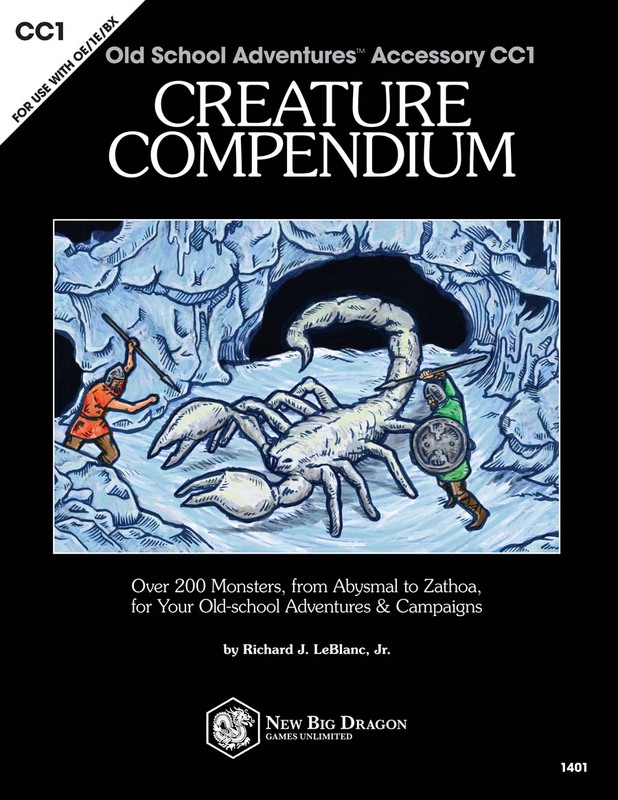 First, I'll be giving away 12 print copies of the Creature Compendium. I'll be giving away 1 copy away each day; 10 of the 12 will be open to US recipients only, 1 of the 12 has already gone to a Canadian, 1 copy has already been awarded to a non-US/non-Canadian recipient, and today is the final US copy. Each print recipient will get a PDF copy as well. UPDATE: Congrats to M Po on being selected as the recipient of this item! UPDATE: Congrats to Ngo Vinh-Hoi on being selected as the recipient of this item. Comments close at 6am EST tomorrow (December 20, 2015). First, I'll be giving away 12 print copies of the Creature Compendium. I'll be giving away 1 copy away each day; 10 of the 12 will be open to US recipients only, 1 of the 12 has already gone to a Canadian, and 1 copy has already been awarded to a non-US/non-Canadian recipient. Each print recipient will get a PDF copy as well. UPDATE: Congrats to Matthew Schmeer on being selected as the recipient of this item! UPDATE: I decided to pick two recipients for this. Congrats to Bark and elrics on being chosen as recipients for this item! Comments close at 6am EST tomorrow (December 19, 2015). UPDATE: Congrats to Aleks on being chosen as the recipient of this item! UPDATE: Congrats to Patrick for being selected to receive this item! Comments close at 6am EST tomorrow (December 18, 2015). UPDATE: Congrats to V.A. On being chosen as the recipient of this item! UPDATE: Congrats to Drew on being selected as the recipient of this item! Comments close at 6am EST tomorrow (December 17, 2015). UPDATE: Congrats to Pastor Beau on being selected as the recipient of this item! UPDATE: congrats to Ryan Hixson being selected as the recipient of this item! EXCEPT the US and Canada (see below). Comments close at 6am EST tomorrow (December 16, 2015). First, I'll be giving away 12 print copies of the Creature Compendium. I'll be giving away 1 copy away each day; 10 of the 12 will be open to US recipients only, 1 of the 12 has already gone to a Canadian, and today's copy is open to any location in the world except the US or Canada. Each print recipient will get a PDF copy as well. UPDATE: Congratulations to Gabriel Perez Gallardi from Uruguay on being selected as the recipient of this item! UPDATE: Congratulations to Tim Shorts on being selected as the recipient of this item! but there will be an upcoming international giveaway (see below). Comments close at 6am EST tomorrow (December 15, 2015). First, I'll be giving away 12 print copies of the Creature Compendium. I'll be giving away 1 copy away each day; 10 of the 12 will be open to US recipients only, 1 of the 12 has already gone to a Canadian, and one copy will be open to any location in the world except the US or Canada. Each print recipient will get a PDF copy as well. UPDATE: Congratulations to Prowler on being selected as the recipient of this item! UPDATE: Congratulations to Jeremy Smith on being selected as the recipient of this item! This one gave me a chance to use a d30 to pick the winner, and the roll was a 3! Comments close at 6am EST tomorrow (December 14, 2015). UPDATE: Congratulations to DungeonMapper on being selected as the recipient of this item! This was another one that gave me a chance to use my d24 to pick the winner! This goes to prove that being one of the first or last few to get in is not always a bad thing. UPDATE: Congratulations to imredave on being selected as the recipient of this item! but there are other US and international giveaways (see below). Comments close at 6am EST tomorrow (December 13, 2015). UPDATE: Congratulations to Todd on being selected as the recipient of this item! This was the first time he ever commented on a blog, and it paid off for him! UPDATE: Congratulations to Steve Gilman on being selected as the recipient of this item! Also, this one gave me a chance to use my d24 to pick the winner! but there will be upcoming international giveaways (see below). Comments close at 6am EST tomorrow (December 12, 2015). UPDATE: Congratulations to G-woulf on being selected as the recipient of this item! As a reminder, winners are selected via the following process: 1) I print out a list of the comments, I strike through double and triple commenters (many of which I know are accidents from the blog posting process), then I number the remaining comments and choose a random winner from those (which I have, so far, been letting Siri take care of). UPDATE: Congratulations to Kelroy on being selected as the recipient of this item! Comments close at 6am EST tomorrow (December 11, 2015). UPDATE: Congratulations to Avram Shannon on being selected as the recipient of this item! UPDATE: Congratulations to Matt Maranda on being selected as the recipient of this item! Comments close at 6am EST tomorrow (December 10, 2015). UPDATE: Congratulations to Mike Monaco on being selected as the recipient of this item! My 12 Days of OSR Christmas Prep is Done! The 24 posts have been loaded. 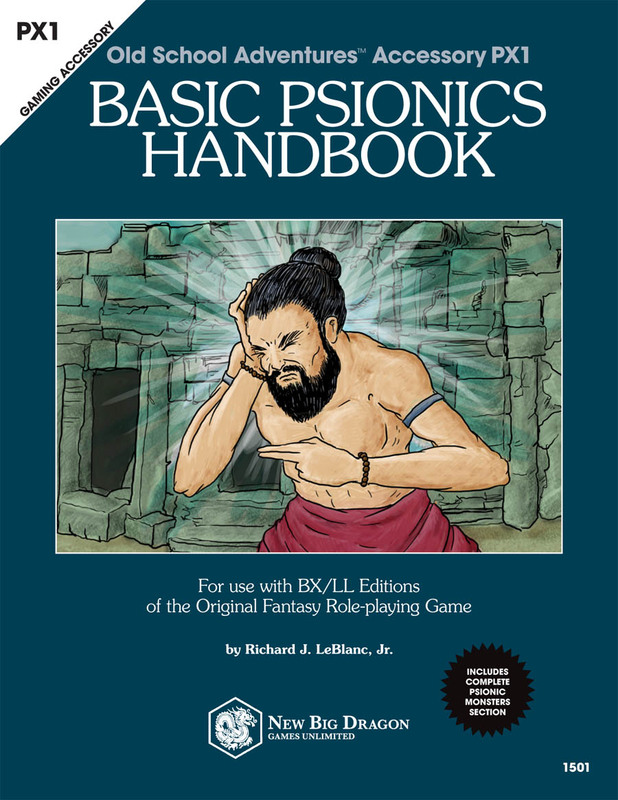 The first one goes up at 6am EST, and another post follows every 12 hours for the next 12 days, as I proceed to give away 12 print copies of the Creature Compendium, and 12 PDF copies of the Basic Psionics Handbook. I've even packaged up the 12 print copies of the Creature Compendium, so they're ready to be labeled and shipped!